The foreign-born population in the Kansas City metropolitan area has grown rapidly over the past quarter-century: from 33,000 in 1990 to 135,000 in 2015. All told, the number of immigrants grew more than 300 percent during the period, at a time when the total population in the metropolitan area grew by 40 percent. Though a large share of immigrants were born in Mexico or Central America, overall the region’s foreign born come from diverse ethnic backgrounds and possess various skill levels. Immigrants from several Asian countries outperform the U.S.-born population in terms of educational attainment, income, and earnings. Using data from the U.S. Census Bureau’s American Community Survey, this fact sheet describes in detail the foreign-born population of the five main counties that comprise the Kansas City region: Johnson and Wyandotte in Kansas; and Jackson, Clay, and Platte in Missouri. The authors find that immigrants contribute significantly to the regional economy, working in a variety of industries and establishing strong roots in the community as long-term residents, homeowners, and parents of U.S.-citizen children. 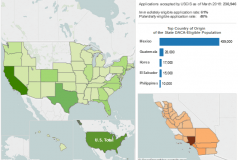 Use these data tools to learn about populations immediately and potentially eligible for the DACA program (as unveiled in 2012) nationally and for top states and counties. These tools provide estimates of unauthorized immigrant youth currently and prospectively eligible for relief from deportation nationally and for 41 states and 118 top counties. They also offer DACA application rate data and top countries of origin for eligible populations at national and state levels. MPI's U.S. Immigration Policy Program analyzes U.S. policies and their impacts, as well as the complex demographic, economic, political, foreign policy, and other forces that shape immigration to the country.